50 years ago this summer, one law declared Oregon's rough, wild coast public. There was a time when Oregon’s sand dunes, tide pools and rocky shores were at risk of being sold off to private buyers. Beach access may have been meted out at the discretion of developers, and the best views, reserved for those who could afford them. Governor Tom McCall slammed the door shut on this future when he signed the Oregon Beach Bill into law on July 6, 1967. In signing the controversial bill, McCall ensured the general public would forever enjoy unfettered access to all 363 miles of Oregon’s rugged, wild coastline. Roughly 50 years later, a hotel in Cannon Beach tried to reserve a section of shoreline for guests, challenging West’s decree. While the Oregon Legislature fought over private property rights, public opinion soon galvanized and united around open beach access. McCall signed the Beach Bill into law in 1967 and today, dozens of state parks, scenic viewpoints, sandy beaches and cliffside trailheads welcome thousands of visitors each year along nearly every mile of the Oregon Coastline. For Havel, that access means more than building sandcastles and enjoying the occasional sunset. “Whether it’s fun with family or a recollection from your everyday life, this is where you come to explain to yourself why it’s worth living in Oregon,” he says. As the Oregon Beach Bill celebrates its 50th anniversary this summer, we’re excited to share our favorite Oregon Coast hikes. Whether you’re looking for a quick getaway from Portland or a more rough-and-tumble adventure farther south, you’ll find plenty to love about Oregon’s public coast. More than a century ago, Floras Lake seemed destined to become “the Atlantic City of the Pacific Coast,” according to the Bureau of Land Management. Developers were poised to construct a landmark hotel, and investors saw the potential for homes, shops and other attractions that would draw visitors from throughout the Pacific Northwest. An economic downturn derailed those plans, and the modern reality is much more muted. Rather than ornate homes and lavish hotels, hikers at Floras Lake Beach are more likely to encounter windswept sand dunes and a host of natural features that remain blissfully untouched. Whether you’re a casual day hiker or weekend warrior, you’ll find something to love about Neahkahnie Mountain—and the views it delivers at the summit. Two trailheads offer drastically different experiences for scaling the signature peak: The southernmost trailhead starts halfway up the mountain and is comprised of a moderately-challenging ascent (roughly 850 feet over 1.3 miles), while the northern trailhead starts from Highway 101 and climbs nearly 1,500 feet over 2 strenuous miles. If you’re up for the adventure, we’d recommend the more challenging trek. Hike the trail in late spring or early summer, and you’ll start in a meadow of wildflowers before entering a dense forest that opens up with occasional ocean views along the way. 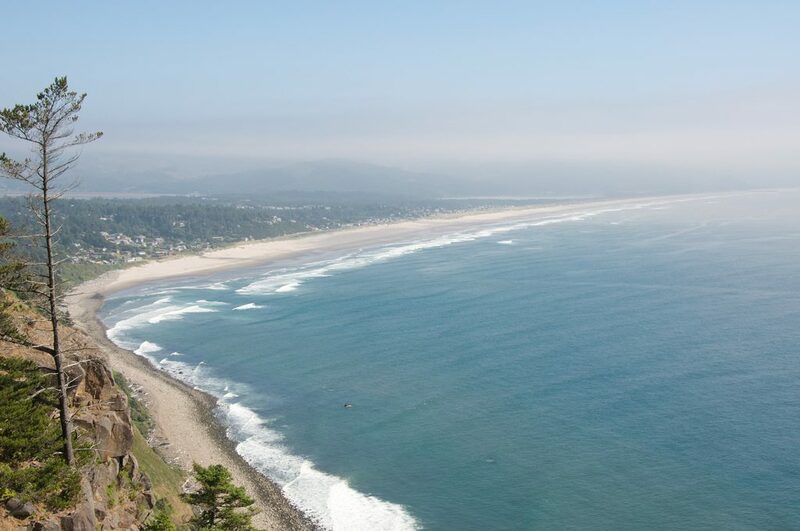 However you arrive at the summit, you’ll love the wide-open views of Manzanita, Nehalem Bay, the Pacific Ocean and the Oregon Coast Range. Just north of the artsy enclave at Cannon Beach, Ecola State Park beckons hikers seeking relief from summertime crowds. Whatever your reason for hitting the trail, you’ll find it between Ecola Point and Indian Beach. Springtime wildflowers line the trail, wide-open cliffsides deliver panoramic ocean views and the coastal rainforest setting always smells like rain. Stretch your legs on this short mile-long jaunt. Along the way, keep an eye out for “Terrible Tilly,” the lighthouse perched atop Tillamook Rock just offshore, and Haystack Rock, a massive basalt structure that's one of the most-photographed landmarks on the Oregon Coast. Head’s up: A swift storm can fell trees, cause flooding, induce erosion and close roads at Ecola State Park. Check with Oregon State Parks and Recreation before setting out. Start your 6-mile loop at Heceta Head, a trail that'll lead you through a rainforest, past a lighthouse and by a beaver pond meadow. Then, it's time for the main attraction: It’s the kind of trail hikers discuss in hushed tones. 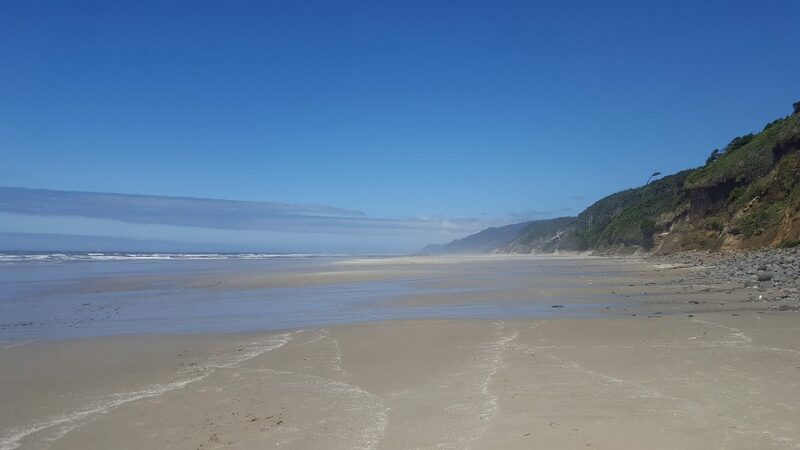 Just north of Heceta Head Lighthouse—blink and you’ll miss it—is a trailhead that transports visitors out of the Oregon Coast and into Middle-earth on the dry sand of this secret beach. Hobbit Trail (not far from the Heceta Head State Scenic Viewpoint) is an easy, short path that starts at Highway 101 and winds its way through a Sitka spruce forest before entering thickets of ferns, rhododendrons and salal; the overgrowth is so crowded in spots, it forms a virtual tunnel over the perpetually muddy trail. Arrive after a few minutes at Hobbit Beach, a remarkably quiet section of Oregon Coast surf. Check out the tidepools at low tide near the hill to your south. Look for a handful of faces carved into the rock. Or simply relax on this lightly trafficked stretch of coastline. 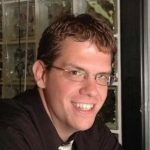 Matt Wastradowski is a Portland-based freelance writer for the Co-op Journal. He enjoys hiking, cycling, writing and exploring all four corners of the Beaver State—ideally, wherever the bars run out on his iPhone. The Oregon coast is awesome, my husband and I loved it. Visited in May this year and late August two years ago, great place to just relax, glad it is public!!!!!!!!! !